In humans it has been used to treat diarrhoea and enteritis caused by bacteria or protozoan infections. It has been used to treat traveler's diarrhoea, cholera and bacteremic salmonellosis. Use in treating Helicobacter pylori infections has also been proposed. Furazolidone is also used for giardiasis (due to Giardia lamblia), though it is not a first line treatment. As a veterinary medicine, furazolidone has been used with some success to treat salmonids for Myxobolus cerebralis infections. It has also been used in aquaculture. It is used to differentiate micrococci and staphylococci. It is believed to work by crosslinking of DNA. Furazolidone is no longer available in the US. 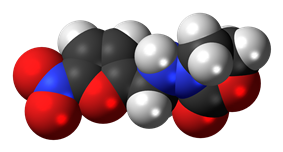 Though an effective antibiotic when all others fail, against extremely drug resistant infections, it has many side effects, and as with other nitrofurans generally, minimum inhibitory concentrations also produce systemic toxicity (tremors, convulsions, peripheral neuritis, gastrointestinal disturbances, depression of spermatogenesis.) Nitrofurans are recognized by FDA as mutagens/carcinogens, and can no longer be used since 1991. ^ Machado RS, Silva MR, Viriato A (2008). "Furazolidone, tetracycline and omeprazole: a low-cost alternative for Helicobacter pylori eradication in children". Jornal de pediatria 84 (2): 160–5. ^ Petri WA (February 2005). "Treatment of Giardiasis". Curr Treat Options Gastroenterol 8 (1): 13–17. ^ Meng J, Mangat SS, Grudzinski IP, Law FC (1998). "Evidence of 14C-furazolidone metabolite binding to the hepatic DNA of trout". Drug Metabol Drug Interact 14 (4): 209–19. ^ Bagley, Clell. "Drugs Prohibited from Extralabel Use in Animals". Retrieved 14 April 2014. ^ "DrugBank: Showing Furazolidone (DB00614)". Retrieved 2008-12-19.